The fourth at Royal Portrush. Picture via http://www.royalportrushgolfclub.comGraeme McDowell reckons Keegan Bradley is a Major addition to what promises to be a sell-out Irish Open. The Portrush ace and Open champion Darren Clarke helped convince the reigning US PGA champion to head for Royal Portrush from June 28 to July 1. Bradley, 25, said following his maiden major win in Atlanta that he was determined to play in the Irish Open at some stage of his career. And with Irish relations in Cork and Galway, he confessed that it was pals McDowell and Clarke who persuaded him to make that wish come true this summer. Confirming his debut on European soil, Bradley said: “I’m very proud of my Irish heritage and I’ve wanted to represent them in the Irish national championship. Crowds of up to 100,000 are expected to flock to the Co Antrim venue to see at least five major champions in action with world No 22 Bradley now joining Clarke, McDowell, Padraig Harrington and Rory McIlroy in the field. Tickets for the first Ulster staging of the Irish Open since 1953 have been selling like hot cakes since the venue was announced. Ranked fourth in the US Ryder Cup points list, Bradley looks certain to make Davis Love’s side to face Europe in Chicago in September. But at least six of the European side that won back the Ryder Cup at Celtic Manor in 2010 are also set to travel to Portrush with 2010 champion Ross Fisher and the Molinari brothers Francesco and Eduardo joining Harrington, McIlroy and McDowell in the field. It will be Bradley’s first event on European soil and he may not be last star to book his ticket to Northern Ireland and get some early links practice for The Open just three weeks later. Meanwhile, world No 1 McIlroy insists that Tiger Woods should not be written off despite his recent poor form and the emergence of new stars like Wells Fargo champion Rickie Fowler. McIlroy has decided to put a two iron his bag this week to make sure he’s playing as often as possible from the short grass. Despite hsi prodogious length with the driver and three-wood, the club is likely to be his friend in the US Open at The Olympic Club next month and in the Open at Royal Lytham and St Annes. “It’s a big advantage if you’re playing from the fairway, especially with the small greens,” McIlroy said. “And the rough around here, it can be a little thick in patches and it can be a little tricky. US PGA champion Keegan Bradley is believed to be thinking seriously of digging up his Irish roots with an appearance in next month’s Irish Open. “If you haven’t got a ticket for Friday, Saturday or Sunday, you’re not getting in.”Irish Open fever is gripping the country with Friday’s play at Royal Portrush already a complete sell-out. Keegan Bradley: “This is a bunker on the 17th at Portrush Wee bit of a lip. 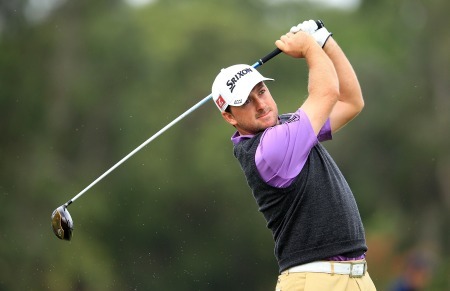 #I’mdelirious #nosleep #IrishOpen”Chris Devlin will be reunited with his old college buddy Graeme McDowell today after landing a last gasp invitation to tee it up in a near sell-out Irish Open at Royal Portrush.